← Where We’re Going We Don’t Need Road Maps! Patch 5.5 didn’t come with much in the way of content, but it did include several quality of life improvements including a most welcome increase in the number of Strongholds and a revised Cartel Market interface. The most significant change to the Cartel Market has been the addition of many more direct sale items, most notably dozens of dye modules that previously were only rarely available directly from the Market or randomly from packs. For anyone looking to customize their characters this is a very nice change indeed. However, before dropping Cartel Coins on a fancy dye module, take a look at some of the other options out there. You can often find something that looks just as good if not better for a fraction of the GTN cost without spending even a single Cartel Coin. To that end, I thought I’d share, in no particular order, a dumb top five list of my favorite non-Cartel Market dyes. I’ll just come right out and say it: Black/Black is boring. Yeah, ninjas are cool but black works best with contrast, even if it’s subtle. Darth Maul’s red skin stands out against his black tunic, and while Darth Vader is armored head to toe in black, he is a case study in creating contrast by mixing flat and glossy tones. Artificers have numerous choices in creating dyes that mix black with other colors including blue, red, gray and even a creepy pale yellow. But I’ll highlight Dark Red and Black which I think is the best alternative to black/black, especially for Sithy characters. 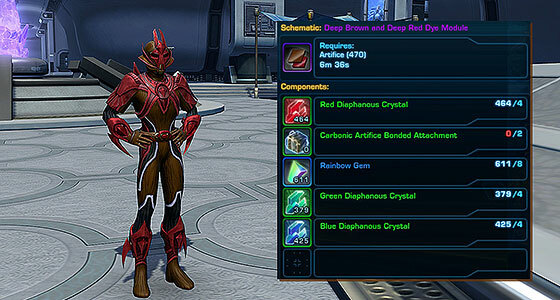 The recipe for this dye module can be purchased by characters of Champion reputation rank from the Coalition Forces vendor on Yavin IV, and requires Artifice of skill level 500. Next up is an affordable alternative to White/White. 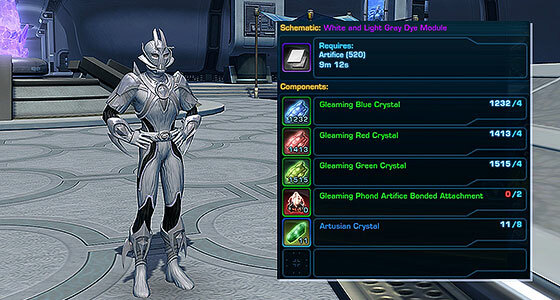 Unless you’re looking to be ghostly white, this dye module should do the trick, assuming it’s not after labor day. This recipe can be learned from the Artifice trainer at skill level 520. 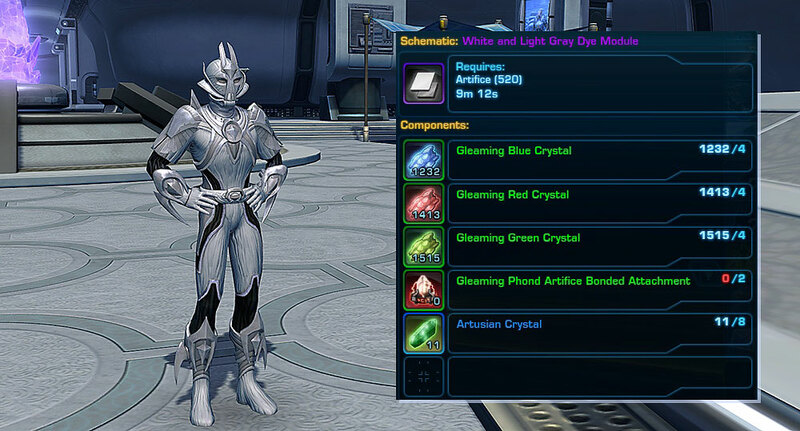 If you want to dye one piece of gear all one color, say white gloves or black boots, crafted dyes are the way to go. It’s not at all unusual for the either primary or secondary colors to not register much or even at all on some pieces of gear, and you can easily get the look you want with little expense or trouble. 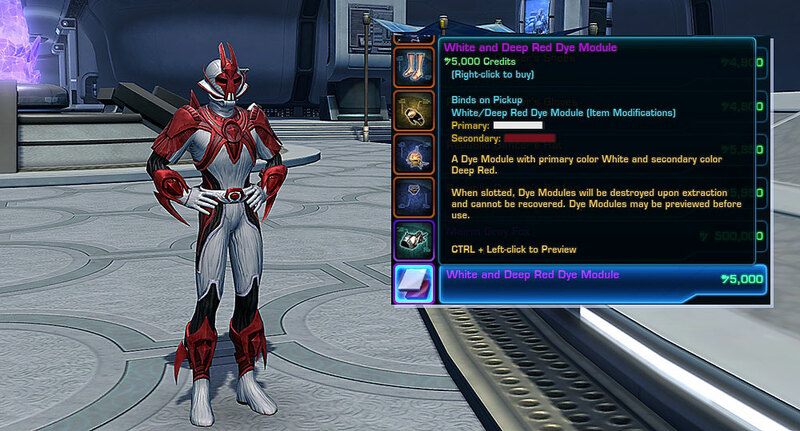 I am a big fan of the single color primary and secondary dye modules. These dyes can make either subtle or dramatic changes that still maintain the original look of the outfit to which they are applied. I’m giving the award to the Secondary Pale Brown Dye Module which can add some faded gold highlights that make details on some outfits pop. But the other dyes of this type can personalize a suit of trooper armor or complete the look of a Corellian Green Jedi. Primary and secondary dye modules of deep green, deep purple, light orange, medium gray and pale brown can be learned from the Artifice trainer at various skill levels. Maybe because it’s autumn, but the color red is getting a lot of love on this list. I thought about picking another dye module, but I really do think these warm colors go well together. I’ve used them on an Iron Man cosplay as well as smuggler jackets and bounty hunter armor. The recipe for this module can be learned from the Bounty Broker’s Association reputation vendor in the Cartel Bazaar section of both Fleets and requires Artifice skill level 500 and costs 50 Completed Bounty Contracts. The last dye on my list is not crafted but can be purchased for the ridiculously low price of 5000 credits from the security key vendor on both Fleets. Whether you do it for the account security, the extra Cartel Coins or just easy access to a vendor when you zone into Fleet, I highly recommend anyone who is playing to pick up a security key if they can. As for the dye, my Canadian upbringing may be showing, but this is truly one of my favorites. I’ve lost track of how many members of Havoc Squad are wearing these colors. It may be too strong a contrast, but when it works, it works really well. Even leaving aside the ability to craft useful relics and the classic color crystals, Artifice is still my favorite Crew Skill. Whenever I’m looking to customize a character’s look, I am nearly always able to find a crafted dye module that fits the bill. That I can do it without spending any cartel coins or millions of credits on the GTN is pretty sweet. 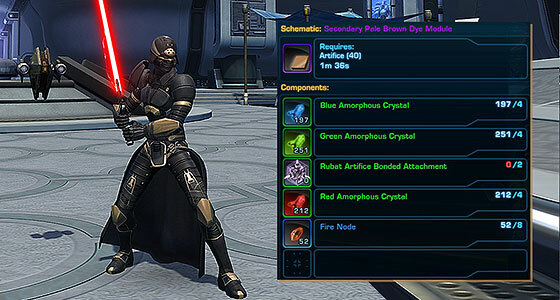 Swtorista created a comprehensive guide to crafting dye modules as part of her excellent Academy series, and if you’re interested in much more detail than I can provide, check it out!